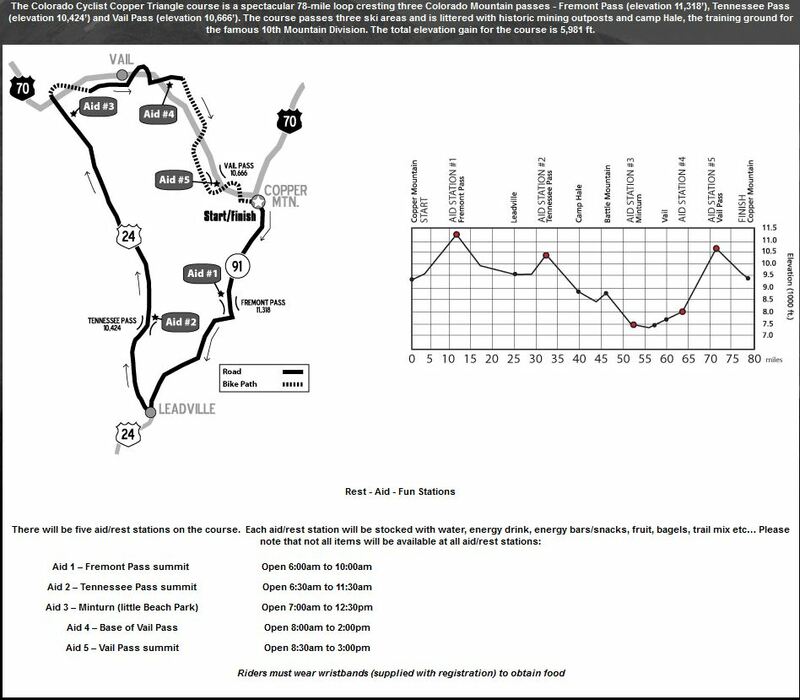 You’ll have to get up early–the ride starts at 7:00 a.m. in waves of 50 a few minutes apart to avoid congestion with the racers, the first group of which head out at 8:45. The ride benefits Colorado Lungs4Life, The Davis Phinney Foundation for Parkinson’s Disease, Georgetown Trust for Conservation and Preservation, and the Bicycle Racing Association of Colorado Junior Development Program. These are serious charities and the ride expects you to raise serious money: registration costs $55 and you must raise $150 or more to enter the ride. At the $150 level you get a beautiful hat and t-shirt. 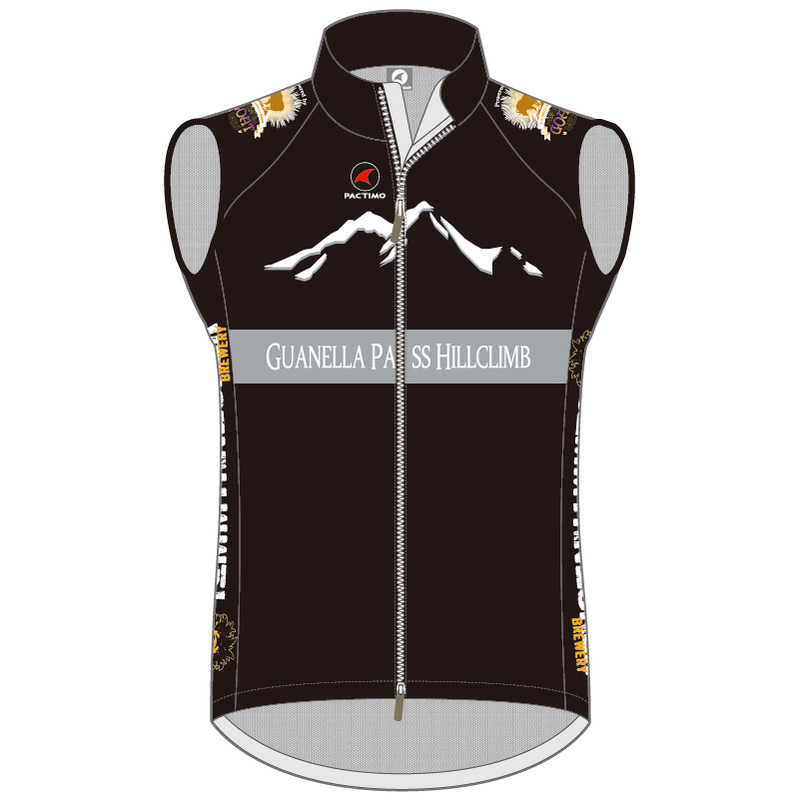 Above that level there are these jerseys and vests from Pactimo. When it is so hot in Denver that the asphalt starts to get sticky and soft you know there’s only one solution: head to the hills. Let the Colorado Eagle River Ride be your siren’s song and pull you out to the Eagle River Valley for a fabulous, well supported century that benefits SOS Outreach, a local non-profit that builds “character in youth through outdoor adventure.” This year’s ride falls on July 27, 2013 and starts and ends in Beaver Creek. 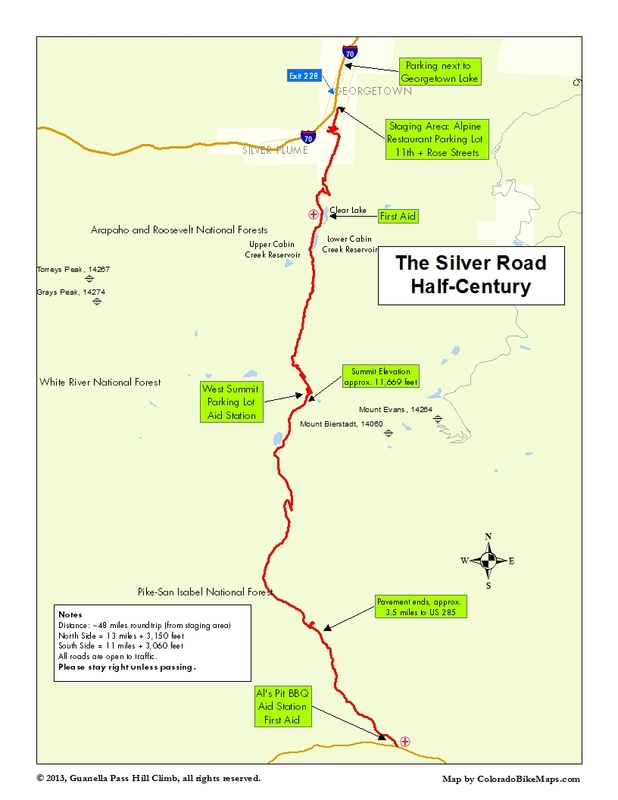 The route is a good one with fine scenery, wonderful climbing from Wolcott up to State Bridge, and a fabulous 20 mile stretch along the Colorado River that’s mostly dirt. But don’t let that stop you. The stretch is remote, beautiful and the road is is decent condition. Total vertical gain is a modest 2,750 feet, so this is a perfect first century if you’ve never tried one before. Sign up here. 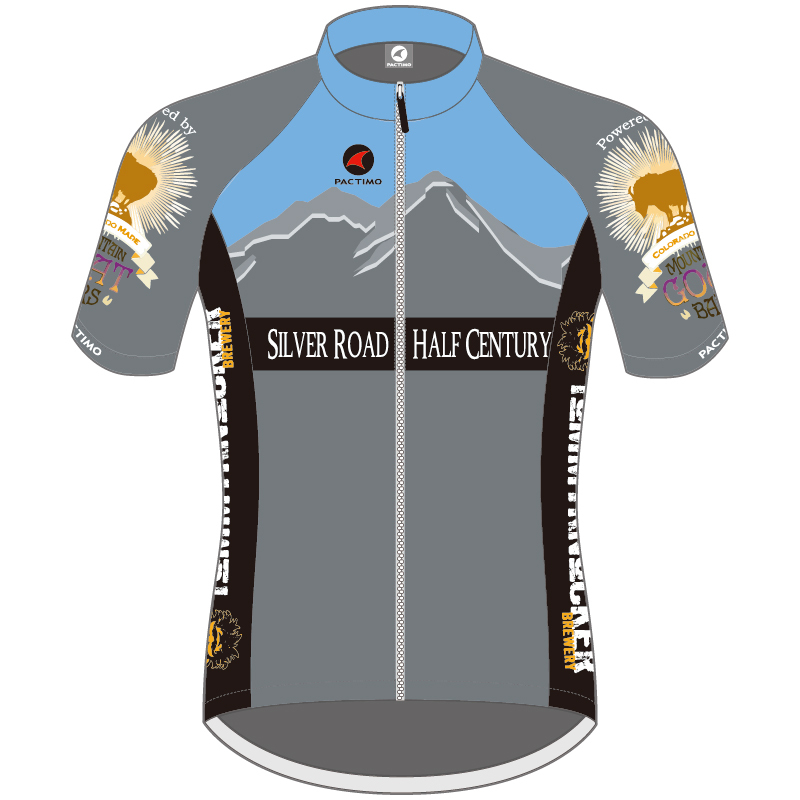 Looking for a challenging century ride (or shorter)? Want to keep it close to home? Fabulous views and lots of climbing important to you? 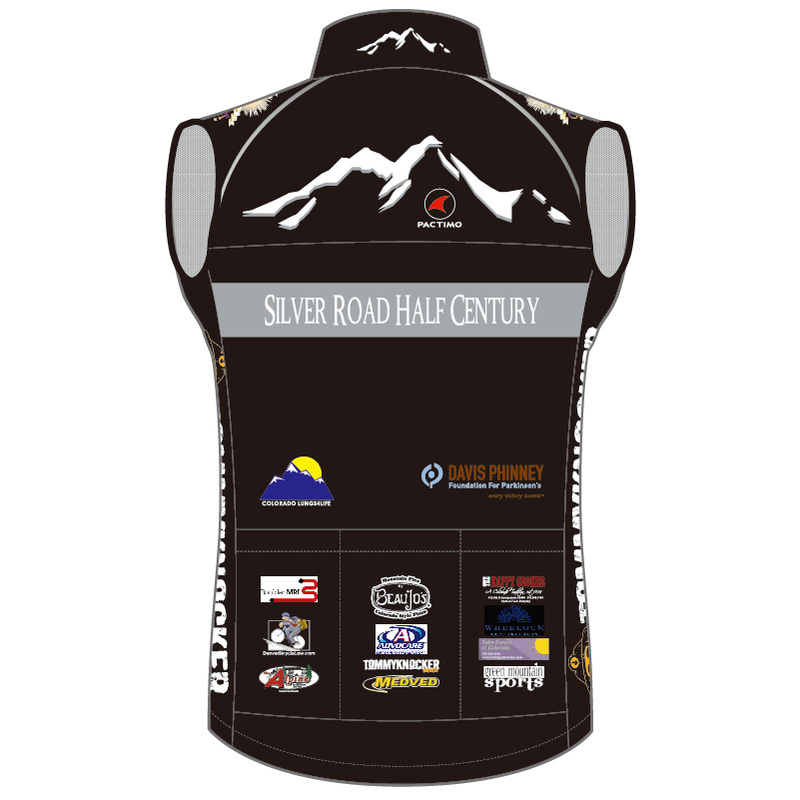 Then it is time to check out the Red Rocks Century, a looping swooping, climbing sun-of-a-gun century that will have your thighs burning long before you get to Squaw Pass. 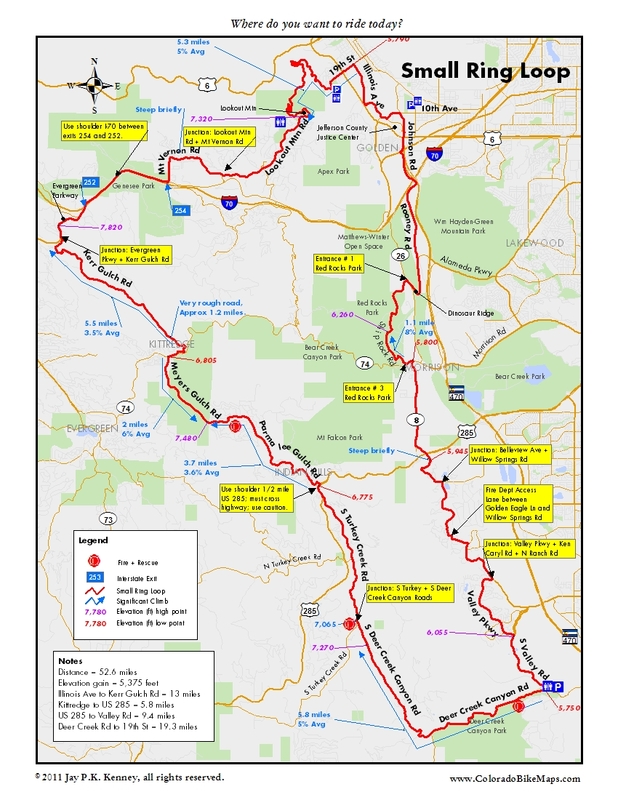 Starting in Morrison, the century begins with a jaunt through Red Rocks Park, spins up Highway 74 to Kerr Gulch then loops along US 40 to Idaho Springs where the big climb begins: Squaw Pass from the west side is rated a 4.9 in the Rocky Mountain Cycling Club’s database of climbs and ranks 8th in the state. But who’s bragging? But wait, there’s more. 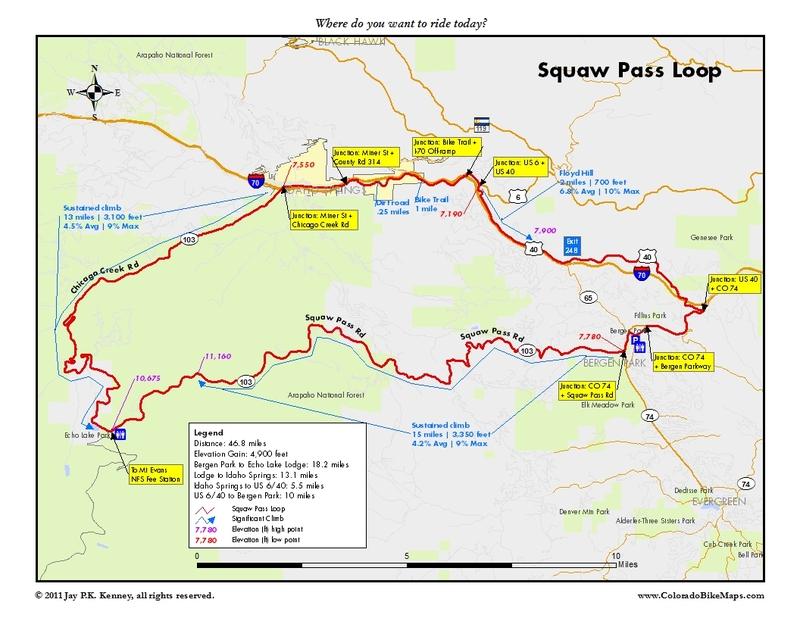 After the 15 miles of pain that Squaw Pass represents you’ll be bombing down to Evergreen from where you’ll start the unheralded but difficult climb up Shadow Mountain Drive (8.5 miles, 5% avg, 15% max). Were that not enough, the climbing finishes out with one of my favorite stretches of steep climbing in the state, up through High Drive, Stanley Park Road and Little Cub (5 miles, 5% avg, 15% max). Now that’s a century. And it is sponsored by Primal Wear so you know the swag is going to be good. Better yet, it is not to late to sign up. 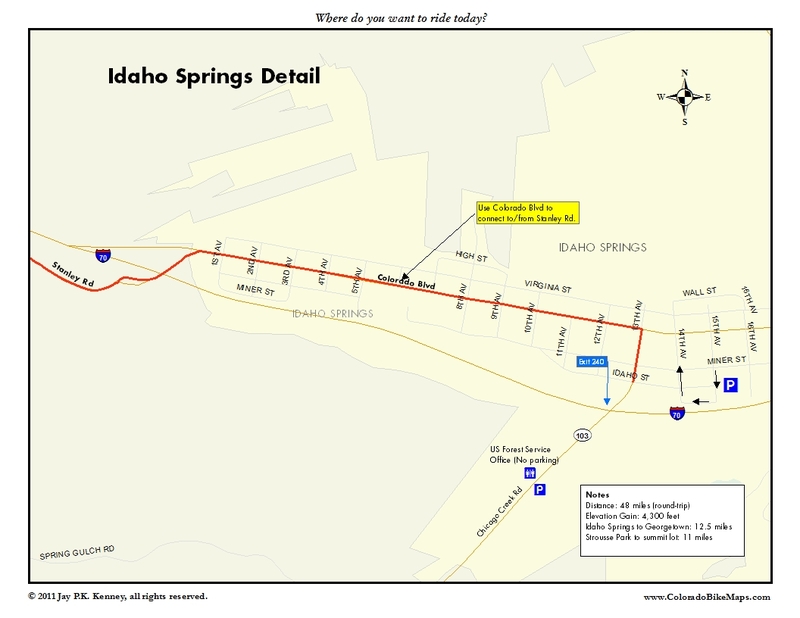 The ride happens this year on Sunday, July 8, 2012. Shorter routes are also available. Sign up here. And when you finish and your legs are screaming at you send me a note and let me know how it went. The claimed elevation gain is over 10,000 feet. The Copper Triangle is an old favorite organized by Davis Phinney to benefit the Davis Phinney Foundation for Parkinson’s. The 2013 date is August 3. Phinney is a celebrated Olympic and professional cyclist, and is married to Connie Carpenter, herself an Olympic speed skating and cycling medalist. Together they raised Taylor, the latest wunderkind on the professional cycling circuit. Davis Phinney was diagnosed with Parkinson’s in 2000 and has devoted his foundation life to raising funds for research and treatment of the disease ever since. These are good people in a hard fight so if you are looking for one organized alpine ride to do this year, the Copper Triangle is a great choice. It is short at 78 miles and the elevation gain (5,981) is doable with a moderate amount of training. 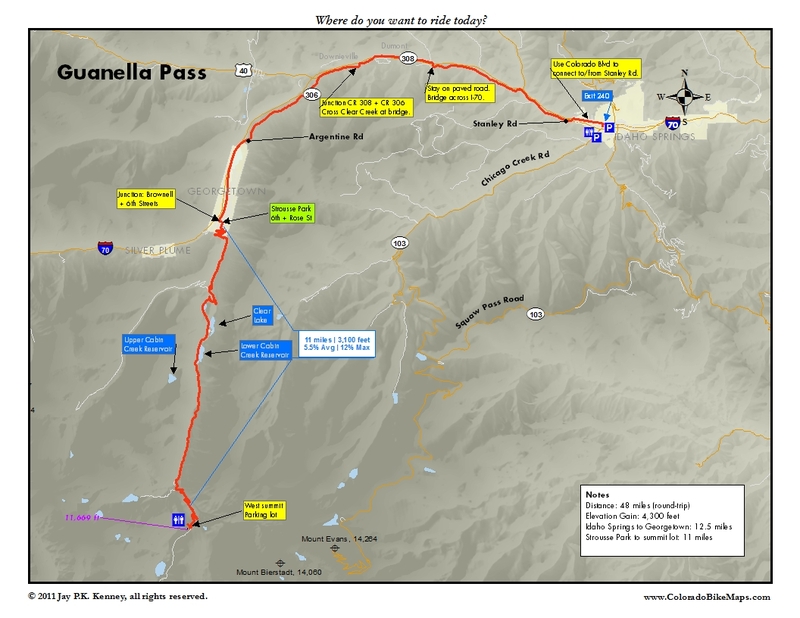 After climbing from Copper Mountain up Fremont Pass to Leadville you ride downhill to Vail where you begin a long pull up the west side of Vail Pass, much the longer and steeper of the two sides. And even if you are not able to make it this year to the Triangle, add the route to your bucket list. It is a good one with simple logistics, relatively easy access to services if things go awry, and many options on starting points and direction. The smart money has you start in Vail. 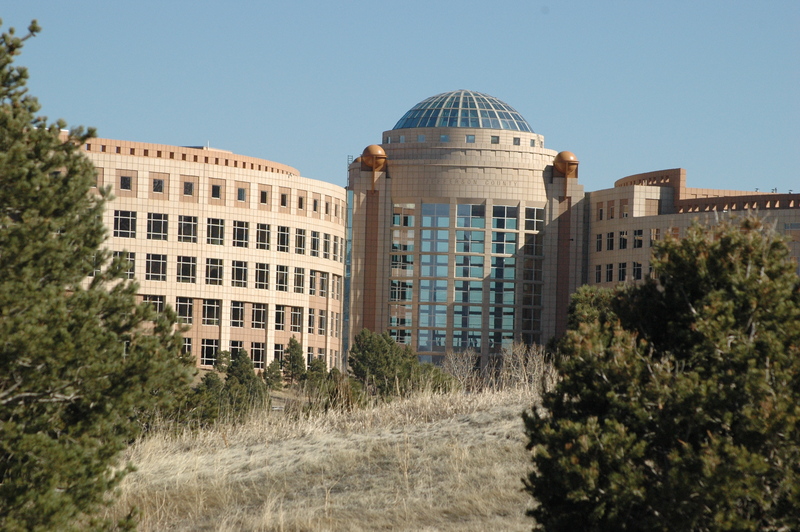 That allows you to get the hardest climb out of the way first and lets you finish in Vail with its relative wealth (compared to Copper Mountain) of restaurants and services. There’s just no two ways about it: this is a pure, unadulterated climb. You start in Idaho Springs or at the foot of Fall River Rd and you climb for 10 miles until you reach the top and you turn around and come home. At the top there are no commercial attractions. No convenience stores. No espresso. Nada. 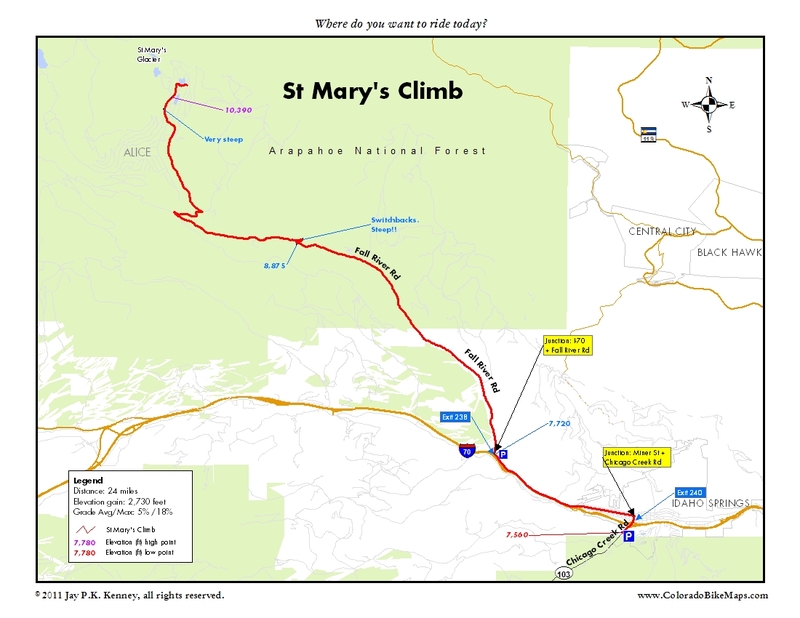 But its a good climb, 10 or 12 miles and 2,700 feet, but even those stats don’t tell the whole truth, since like all good climbs St Mary’s starts off gently and builds to a couple of steep crescendos, where the slope jumps up into the high double digits. 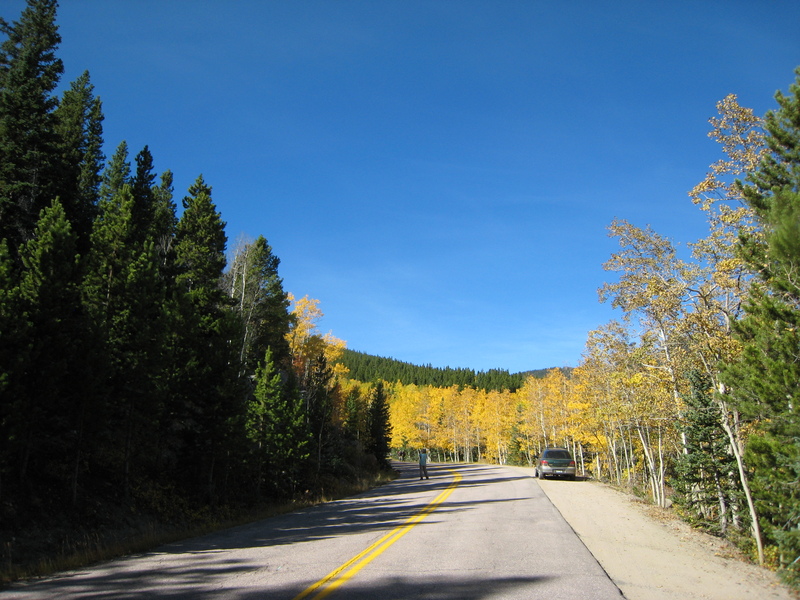 Start in Idaho Springs, at the parking lot just beyond the Clear Creek Ranger Station on Chicago Creek Rd, or just off the Interstate in a small lot near exit 238. There’s water and restrooms at the Ranger Station, but they don’t want you to park long term there. Use the lot on the left just up the road to Mt. Evans. If you start in Idaho Springs, you’re required to ride on the Interstate shoulder for 2 miles and some find this objectionable. And don’t get fooled by the sweet looking frontage road on the south side of Clear Creek. The Stanley Rd looks like it should take you up river to Exit 238 but there’s no place to cross back over to the north bank until you get up into the Dumont area. If you’ve time at the end of your ride, however, cross over and ride a short ways up to admire the Stanley Mine, itself. to the north and west. It is a good spot for a bar and some water, before heading back down to Idaho Springs. 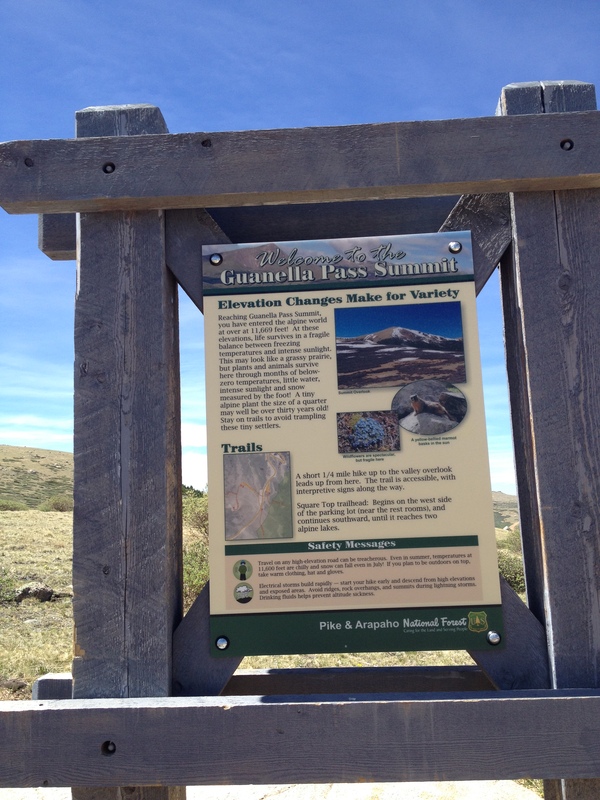 Look to the Squaw Pass Loop description if you need some ideas on where to get a bite to eat in Idaho Springs. Squaw Pass and its big sister, Mt. Evans, don’t need a lot of introduction for local cyclists. 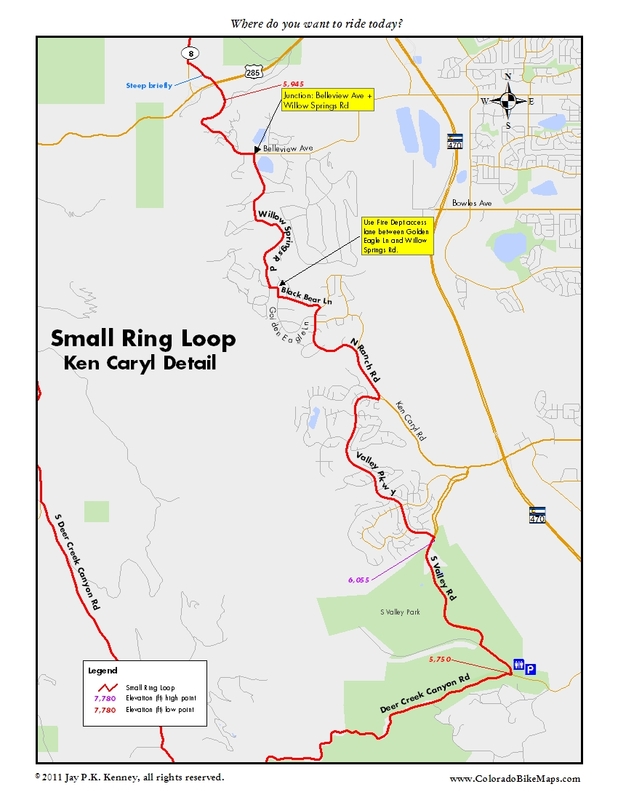 The standard ride is from Bergen Park (at the RTD Park n Ride) up and over to Echo Lake Lodge and back for a convincing ride of 36 miles and around 3,900 feet. 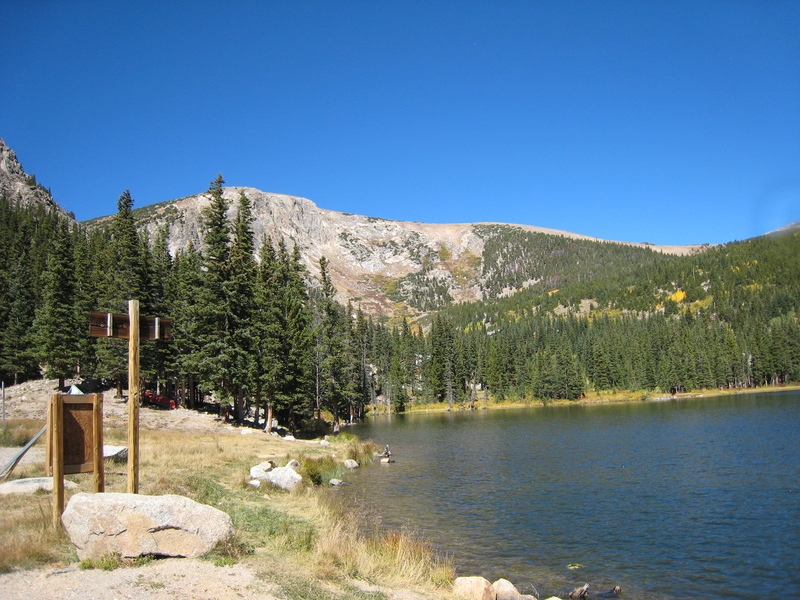 Both ends of the standard ride are anchored by two of Denver’s many mountain parks: Bergen and Echo Lake. 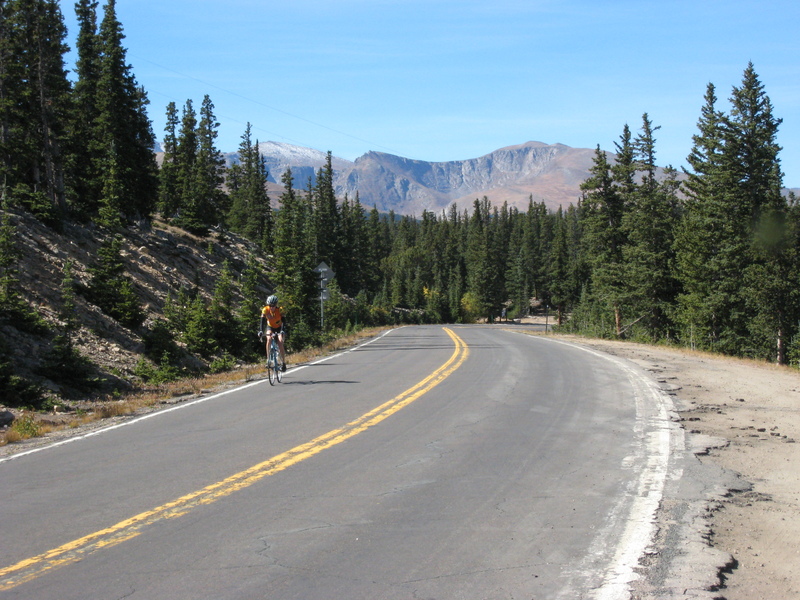 But when you’re ready for more than an out and back, tackle the Squaw Pass Loop. At 47 miles and almost 5,000 feet, this is a good intermediate-length training ride. I like riding it clockwise. There’s slightly less traffic heading up the Squaw Pass Rd than up Chicago Creek Rd (the natural approach to Evans for most auto traffic), and I love the steep climb up Floyd Hill. Start as if you were just doing the standard out-and-back. Climb up and over Squaw Pass. Because of the protected watershed to the north and the abundance of open space, the views in all directions are fabulous, especially in the fall. As you begin to descend towards Echo Lake, Mt Evans and its barely visible road come into focus, a reminder of how much further and harder it is than what you’re doing today. Take a break if you need to at the Echo Lake Lodge. They people there are friendly to cyclists. 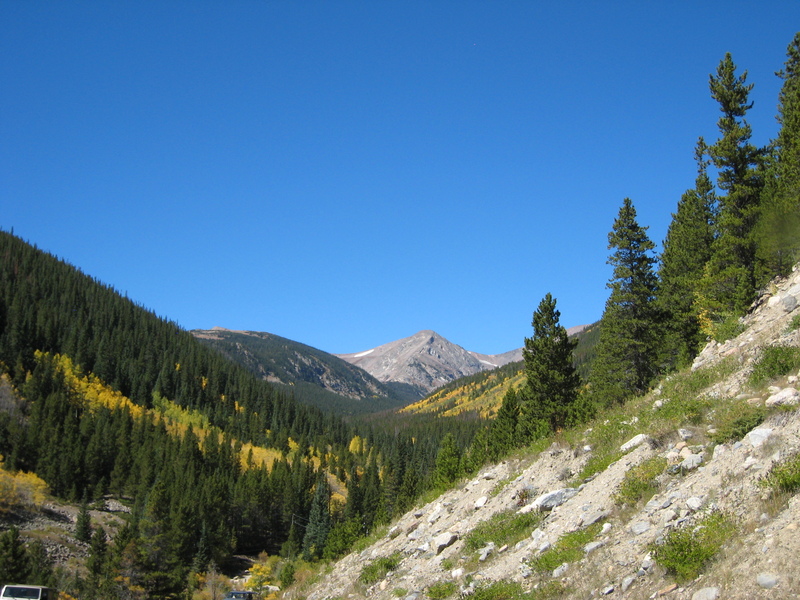 Then head down to Idaho Springs on Chicago Creek Rd. 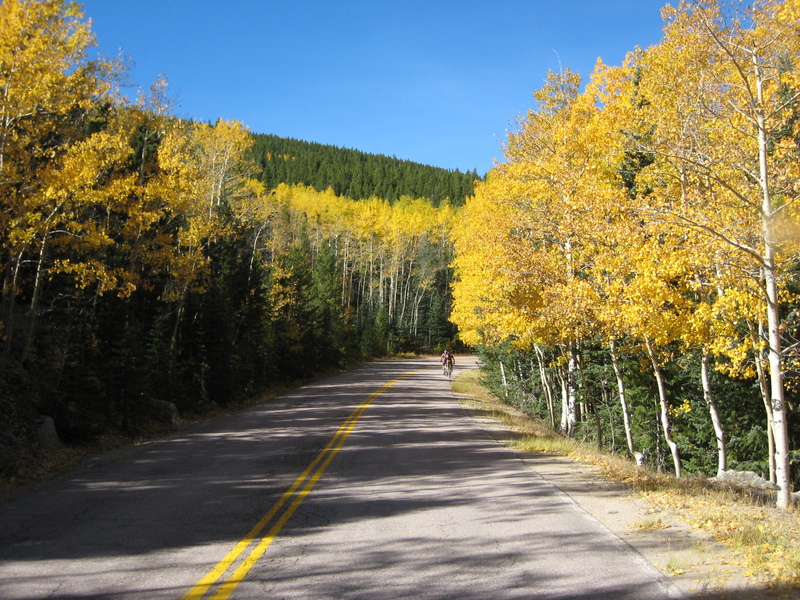 It is a breathtaking descent and will lead you across I-70 and into Idaho Springs. If you are hungry or need an espresso, check out Two Brother’s Deli, or Tommyknockers. Find Miner St. Ride east. Everything funnels into a narrow V as you go east until you are forced to cross over Clear Creek. Most traffic jumps onto I-70 here, but you’re looking for the frontage road, a/k/a County Rd 314. It takes you away from the madding crowd, to the south bank of Clear Creek. There’s some commercial traffic here from a sand and gravel operation, as well as from the rafting operation, but for the most part this is an easy and enjoyable stretch. There’s a very short stretch of dirt road that you can miss entirely by crossing to the north bank of Clear Creek on the Scott Lancaster Memorial Trail, but the dirt is pretty easily negotiated. The road dies after a while but continues as a bike trail. Eventually it spits you out near the bottom of Floyd Hill, where some bicycle legerdemain (legerdepied?) sneaks you around to US 6 and US 40. 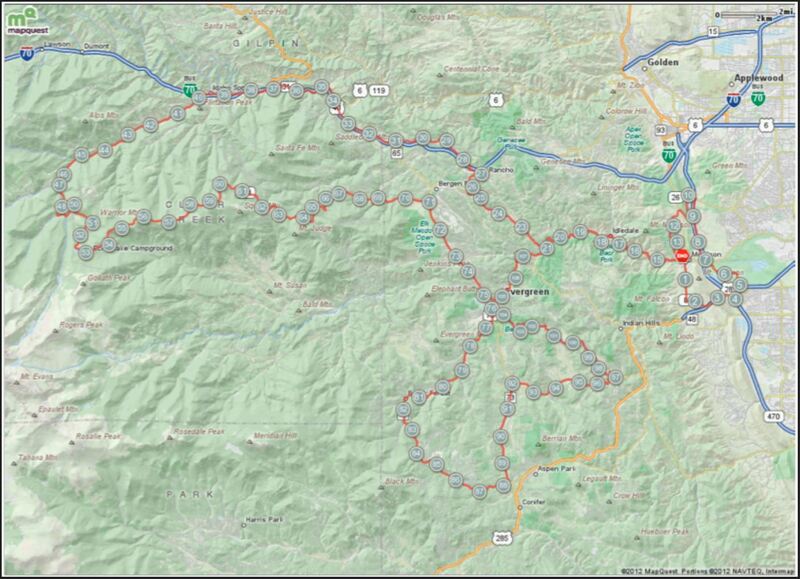 Climb up Floyd Hill then follow US 40 around to the north of I-70 until it rejoins the interstate at exit 251. This stretch of US 40 is quiet and surprisingly enjoyable. Cross over I-70, pick up Evergreen Parkway (CO 74) and follow it until you reach Bergen Parkway. It is slightly safer to exit left here at the light and work your way back to your car than it is to continue on Evergreen Parkway. In the sweeping left hand turn ahead on Evergreen Parkway, the right shoulder completely disappears leaving you exposed and vulnerable to traffic behind you. 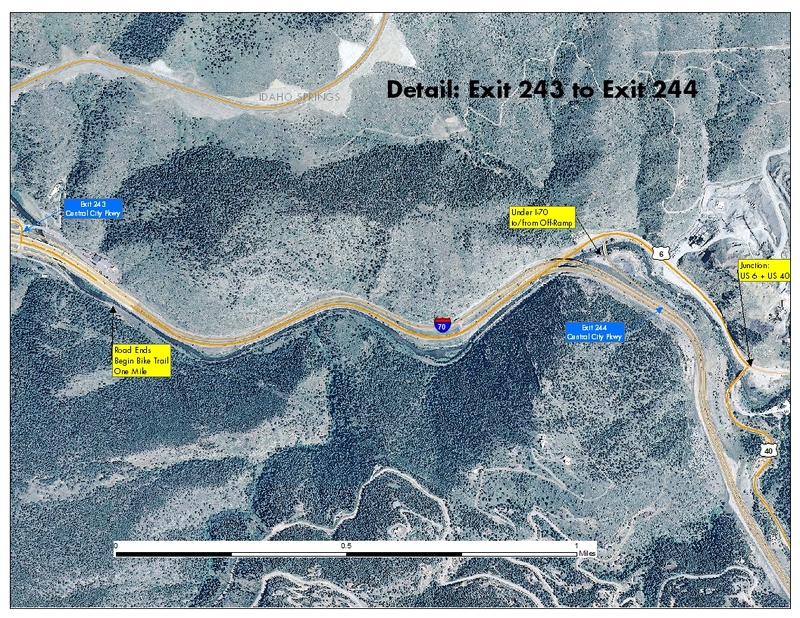 And if you are pressed for time, you can shave a 3.5 miles and a few minutes off the return by crossing I-70 at Exit 248 and returning to Bergen Park via CR-65.